2018 has become the year of The Return of Monster Dad, to some extent. I have made a lot of noise about the fact that I have NOT been making a lot of noise around here for some time now. While I never intended to stop writing Monster Dad posts, it just kind of happened. As chronicled in many posts over the past year (including "The 2018 State of the Blog Address") Monster Dad has always remained in my mind, and I've have many, many post ideas in my head over the years--even if they've never managed to get out of my head and posted here. So what "milestone" are we marking here? Well, it's admittedly a pretty minor one, but one that I think is a good sign for things to come. 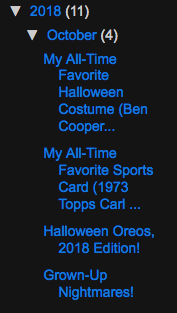 On Halloween (October 31) I posted the blog "My Favorite Halloween Costume of All-Time (Ben Cooper Star Wars Stormtrooper)". It was the fourth post of October and the 11th post of 2018. Those aren't very impressive numbers by any means, but those numbers are exactly what the minor milestone is all about. Please allow me to explain why those seemingly meaningless numbers mean so much to me. I was still writing regularly at the beginning of 2012, but my YouTube channel really began to take off. The focus of that channel (mostly videos reviewing military rations) was quite different from the kinds of things seen at Monster Dad, but I really got caught up in the numbers and statistics there (video views, subscribers, comments, likes...) and ended up spending a lot more time filming, editing and posting videos than writing blogs. Then in September 2012 we moved to a new town and I just couldn't seem to find the time to write any more--despite the fact that the ideas for blogs kept flowing. 2012 ended with 35 Monster Dad posts. That was a huge drop-off from the 62 in 2011, but still the second highest monthly total to that point. By the time 2013 rolled around it probably seemed like I had pretty much completely abandoned Monster Dad. That was never the intention, but it certainly did appear that way. In 2013 I wrote a grand total of four posts. 2014 saw a complete year without a single post (I still find that kind of hard to believe). There were three posts in 2015, followed by two each in 2016 and 2017. 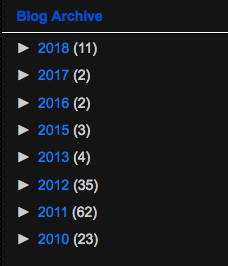 So after totaling 23, 62 and 35 posts over the first three years, I was only able to muster a total of ELEVEN posts total over the next FIVE YEARS combined. That's an average of barely over two posts per year--a far cry from the one-post-per-week target from a few years earlier. So now perhaps the reader can start to see why I'm celebrating the fact that I've written eleven blog posts this year (2018). That number--while pretty lean by any account--actually equals my output over the past five years combined! And, the four posts from October equals the highest number of posts for any complete YEAR between 2013 and 2017. I'm certainly not suggesting that those numbers are good or acceptable, but it definitely counts as a good start--or should I say a good "re-start" (and there's still two months left in 2018). 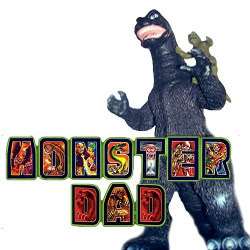 In Hollywood this might be considered a reboot of Monster Dad. Or, in computer terms, maybe I should think about re-naming the blog Monster Dad 2.0? However it might be classified, I think the bottom line is that the blog is finally moving in the right direction for the first time in a long time. And that makes me very happy! A stay-at-home father of two girls who loves old monster, science-fiction and horror movies (especially the bad ones). Just trying to navigate through the randomness of life, while bringing up his daughters to the best of his ability and sharing his interests with them. Review of Bobcat Goldthwait's "Willow Creek"
"Men in Black 3" and Weekly World News: Best Movie Promotion Ever? The Horror That Is "Rudolph, The Red-Nosed Reindeer"